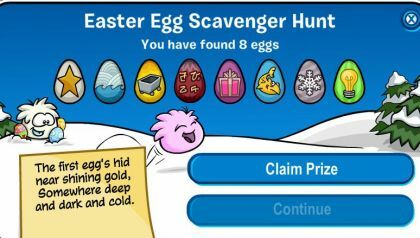 Club Penguin has released this year’s Easter Egg Scavenger Hunt. Below, Club Penguin Paper CP have provided the cheats. Egg 1 is located at the Hidden Lake. Egg 2 is located at the Book Room. Egg 3 is located at the Beach. Egg 4 is located at the Mine Shack. Egg 5 is located at the Cove. Egg 6 is located at the Gift Shop. Egg 7 is located at the Ski Village. And lastly, egg 8 is located at the Beacon. Once you’ve gathered all the eggs, click the egg icon in the top right corner of your screen. When you’ve done that, click on “Claim Prize” to receive the Yellow Bunny Ears. I think this year’s Easter Egg Scavenger Hunt was great, I had a fun time looking for eggs! What do you think of this year’s scavenger hunt? Please leave a comment below and share your thoughts with us on this year’s Club Penguin Easter Egg Scavenger Hunt!